Well lookee what your Northeast Ohio Video Hunter dids dones did dugged up! While going through boxes of tapes, I came across the VHS recording I made of Mystery Science Theater 3000‘s final Sci-Fi Channel broadcast, waaaaay back in 2004 (January 31, to be exact). The episode? 912 – The Screaming Skull (with the Gumby short Robot Rumpus). The time? Saturday morning, 9 AM. The feeling? Well, kinda downbeat, honestly. For as good as this episode was/is, it couldn’t quite overcome the feeling that something special was passing by. By 2004, I had long captured, on good ol’ VHS, all of the remaining episodes that Sci-Fi could legally air (except for a Blood Waters Of Dr. Z re-broadcast – of course the VCR died for that one), which naturally already included episode 912. This, this broadcast, however, it didn’t really matter what the actual episode was; this was all about partaking in the last Mystery Science Theater 3000 on actual television for the foreseeable future. As it turned out, it would be back in about 10 years, but of course no one knew that at the time. There had been so many rights issues with the movies featured on the show over the years that, for all anyone knew, this was it. ‘Course, we still had the official DVD releases, and the tape trading circles, but even to this day there’s just something about actually tuning in to MST3K that feels so right. At least, that’s how I feel about it; your mileage may vary. I explained this all a bit better in that older post I linked to, but long story short: I began watching the show when it moved to the Sci-Fi Channel 1997, and by the summer, I was a die-hard MSTie, which I obviously remain to this day. At the time, you needed a cable box to access Sci-Fi, and unfortunately, my dad decided he didn’t want to spend the extra bucks for the box anymore. Thus, that began a period of living with what I had already recorded, getting others to record episodes for me, and the official VHS releases that were trickling out. That is, until early 2002, when I discovered Sci-Fi had been added to the basic cable line-up. Thanks to Satellite News’ helpful schedule archives, I can pinpoint when exactly I was able to finally see the show on real TV again (via a nearby relative’s house, because at that point we didn’t even have basic cable): February 23, 2002, episode 911- Devil Fish. I was elated (though it figures that the episode largely responsible for turning me into an MSTie, 811 – Parts: The Clonus Horror, had what turned out to be its last Sci-Fi airing about a month prior – just missed it!). It was a ‘reunion’ that lasted nearly 2 years, and it all came to an end with this one last broadcast. Honestly, I can’t believe it’s been over 10 years since this aired. 2004 just does not seem that long ago! I was a junior in high school! 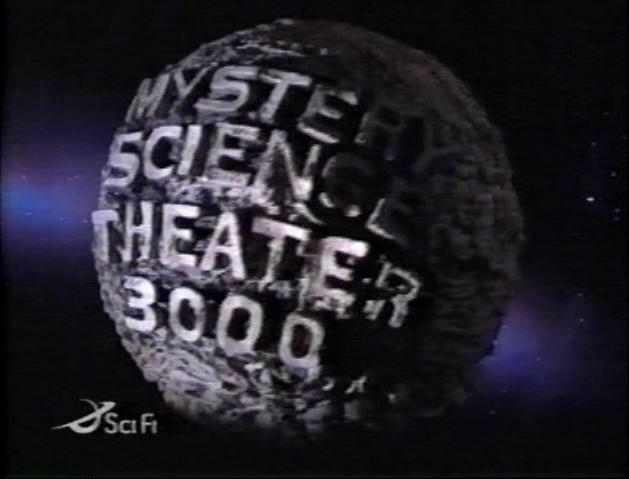 It’s important to note that this wasn’t the actual series finale of Mystery Science Theater 3000; that happened back in 1999, with episode 1013 – Diabolik (though thanks to a rights snafu, episode 1003 – Merlin’s Shop Of Mystical Wonders wound up airing first-run about a month after said series finale, giving heartbroken MSTies one last bit of shiny new freshness). 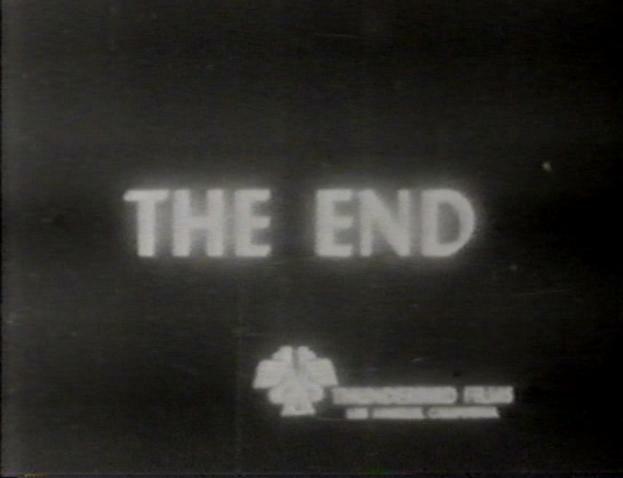 Rather, this was the last episode ever broadcast on the Sci-Fi Channel. Y’see, after the show finished with new episodes in 1999, it went into endless repeats on Sci-Fi, eventually languishing in a Saturday morning time slot where it would remain for the rest of its time on the channel. Advertising had long, long stopped being run for MST3K, so outside of the fan circles, it was just kind of ‘there,’ treated no better than Saturday morning filler. We MSTies knew better, though; unbeknownst to most, this was the way to kick off your Saturday. So, after two whole cable channels and having run since 1989 (technically, three channels since 1988, for you lucky Minnesotans who got to watch the series start on the local independent station KTMA TV-23), it all came down to this one last broadcast on January 31, 2004. Well, until Retro TV picked the series up 10 years later, anyway. Here’s the deal with episodes of this series: they can be very, very subjective. Because opinions on movies and humor can vary so greatly from person to person, there’s always going to be someone who loves a certain episode to death, while someone else will hate it with a passion. From my viewpoint, 912 is a very good episode. Maybe not a start-to-finish smash, but mostly good host segments, fantastic riffing on the short, and a solid take on the movie. There are undoubtedly people out there that will disagree with that assessment, and hey, that’s cool, too. 912 may not be the all-out, blaze-of-glory episode many would have preferred for the final Sci-Fi broadcast, but it is a solid, enjoyable from start-to-finish episode, which seems just as fitting to me. 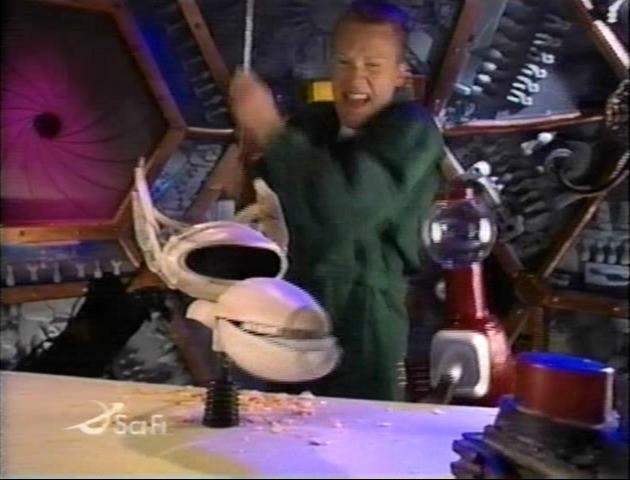 Maybe because it’s so representative of MST3K as it often was: maybe not every riff connected throughout, but the episode was overall consistently funny nevertheless. I wasn’t kidding a bit ago, by 2004 there really was no better way to start your Saturday. The one aspect of this episode that most fans seem to agree about: the short film preceding the movie is phenomenal. The shorts were a rarity during the Sci-Fi-era, there were only three of ’em total, but man, quality over quantity. Of the three, I easily give the edge to this one, the Gumby epic Robot Rumpus. This might as well have been made for MST3K, because it fits like a glove. Truthfully, there are some shorts in the MST3K canon that no longer have me rolling the way they did the first few times I watched them; Chicken Of Tomorrow (from 702 – The Brute Man) used to be one of my favorites, but after the last few viewings, well, it has left me a bit cold. 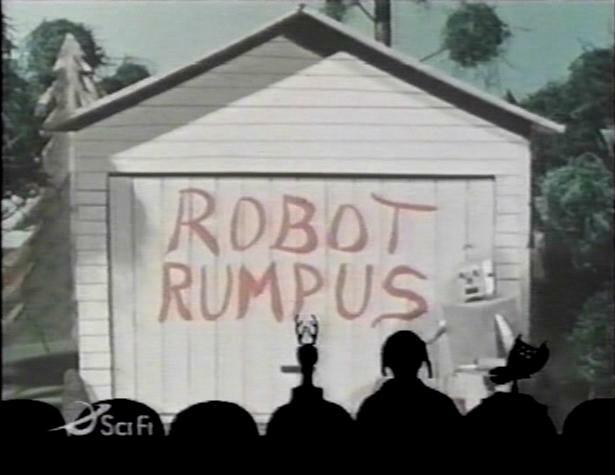 Robot Rumpus, on the other hand, I’ve seen this one so many times that by this point I’m fairly certain I’m never going to get tired of it. It starts out hilarious and stays right there. By the time a shot of Pokey prompts Mike to quip “Close-ups reveal the weakness of the whole premise,” I was done for. This one seems to get better each time I watch it. The plot is, well, it’s a clay-animated Gumby short with the title Robot Rumpus, so don’t expect Shakespeare, alright? In this one, Gumby, rather than do his yardwork chores himself, gets a bunch of robots to do them for him. Things start out peacefully enough, but they soon go haywire; gardens are ruined, paint is thrown about, and a house is lifted off its foundation before Gumby’s pop Gumbo shows to help put things back in order. I’m tempted to call this the weirdest thing ever, but kids programming is by nature usually pretty weird, so it would be an entirely redundant statement (plus, I’m watching a show where a guy and his two robots are trapped in space and forced to watch bad movies; I love MST3K, but I’ll never say the premise isn’t a bit out there – that’s one of the reasons it’s so great!). Also, it’s nice to know that Gumby holds a Class F license. A common charge against some of the episodes with particularly strong shorts before the main movie is that the feature never sustains the momentum of the short. I wouldn’t say this is true 100% of the time, but there are episodes where the short overshadows the movie somethin’ awful. So what am I even babbling about? In the case of 912, you’ve got two forces contrasting each other as much as two forces can be, erm…contrasted? What I’m saying is you’ve got a loud, colorful, clay animated short intended for the lil’ baby childrens, and a long, black & white, slow-moving, drab horror movie for the older set (and by “older set” I don’t mean the “adult” set so much as I do “necking teenagers at the drive-in who couldn’t care less about a skull or why it happens to emitting loud decibels” set). The two don’t really pair well together, for obvious reasons. And yet, together on Mystery Science Theater 3000, somehow it all works. True, the riffing of The Screaming Skull isn’t on the same level as Robot Rumpus, but with such a dramatic shift in tone, I don’t think you could really expect it to be. That said, I really enjoy The Screaming Skull portion of 912. Any movie that starts off with the promise of a free coffin for anyone that dies of fright during it is setting itself up for some quality riffin’, and Mike & The Bots live up to the challenge. I found myself laughing quite a bit throughout the entire feature-portion of the show (some of the riffing on the good Reverend Snow in particular is fantastic; during a conversation in which perpetually-worried-face Jenni unloads her emotional burden to him, Mike’s “You know, the Gospel speaks of losers like you…” and Crow’s semi-cheery “Oh, well it’s hell for you then!” had me roaring). The screencap above makes this one seem more action packed than it really is. The fact of the matter is not a whole lot happens (not until the very end, anyway). This is one of those plots you can more or less figure out from the title and first 5-10 minutes of the film or so. In it, newlyweds Jenni and Eric begin their new life together by moving into the house in which Eric and his first wife Marion lived before her untimely death. Also, she died under somewhat mysterious circumstances. Also, Jenni used to be in a mental institution. Also, Jenni is rich. Where this is all going couldn’t be any more obvious if someone wrote the entire plot out on a brick and threw it at your face. I’m pretty sure children are born with the knowledge of where this is all heading. So yeah, Eric tries to drive his new wife batty (again) and thus to suicide by convincing her the house is haunted by the ghost of his first wife, her skull in particular, which naturally only Jenni can see. …Except there’s a twist here. For the stunning (?) climax, The real ghost of Marion shows up, announcing her presence first by chasing Jenni around (which kinda irritates me, since Jenni didn’t really do anything to draw the ire of the apparition, except maybe keeping her face in an almost constantly pinched expression), and then straight up killing Eric (that’s what you’re seeing in the screencap above). If I’m being completely honest, yes, it’s a dull film with loooong sequences of nothing in particular really happening. BUT, it’s not that bad. I mean, yes, it is bad, no question, but it’s basically inoffensive 1950s drive-in fare. 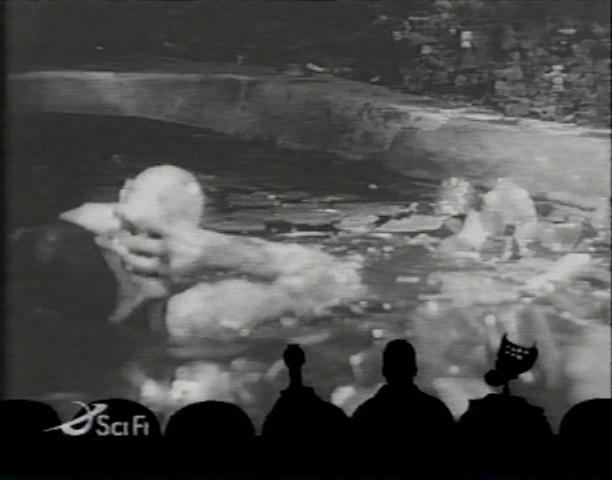 There were infinitely more disgusting things ran on Mystery Science Theater 3000. In comparison to, say, The Beast Of Yucca Flats, The Screaming Skull actually looks pretty derned good (then again, what doesn’t?). And, even though it takes forever to get there, some of the climatic scenes are actually pretty effective, provided you can ignore Eric clearly holding a plastic skull to his neck, and the infamous tossing-a-stool-at-the-ghost scene (which became this episode’s stinger). The movie itself almost lends an easygoing vibe to this episode as a whole, which is weird since it concerns a guy trying to kill his wife with a plastic skull. The proceedings aren’t overly painful, is what I’m trying to explain. Oh, and there’s a Torgo-esque gardener named Mickey. He provides some unintended levity to the proceedings, though he’s still a distant third behind Torgo and Ortega in the “really, really weird lackey that probably needs a shower” category. The host segments for this episode, like I said before, they’re “mostly good.” I wasn’t super impressed with Tom Servo turning into a butterfly or Pearl, Observer & Bobo tricking Mike & The Bots into costumes for no real reason. 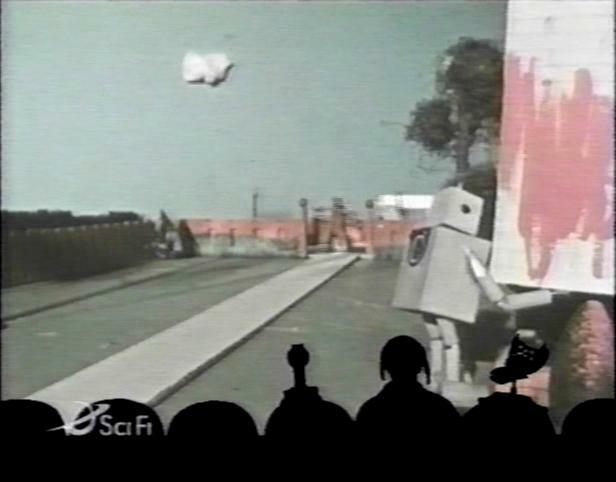 But on the other hand, Servo attempting to scam a free coffin is good, and Bobo being shrunk via the most non-existent special effect possible at the end is funny. 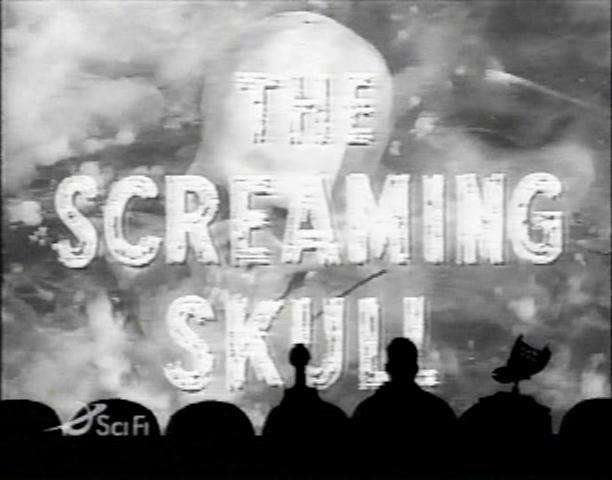 But, my favorite host segment is seen above: Crow decides to scare Mike by being a “screaming skull.” Unfortunately, his (fairly wimpy) scream causes Mike to flip out and continuously scream in terror as he beats Crow over the head with a variety of objects (the best scene of the segment is Mike carefully deciding on the perfect golf club to hit Crow with, all while still screaming). The host segments of MST3K can often be a mixed bag, and this episode is no exception, but this moment in particular is a bonafide winner. I said way up above that advertising for MST3K had basically disappeared from the station following the 1999 series finale. If there were any kind of promos for the series in general following that, I’m unaware of them. I’m guessing there may have been one for Merlin’s Shop Of Mystical Wonders, and Satellite News shows a mini-marathon of episodes at the end of 1999, which I cant imagine there not being some kind of advertising for that. But following all that, MST3K finished life on Sci-Fi strictly on Saturday mornings. When I was able to watch the show in “real time” again in 2002, I certainly never saw any advertising. I want to say there was a “coming up next” deal prior to episodes starting, but even if that’s so, that’s more of a courtesy than anything. Anyway, in regards to this January 31 broadcast, the only thing even in the ballpark of advertising is what you’re seeing above: the little ‘banner’ at the bottom of the screen, reminding you of what you’re watching. Granted, it was common to Sci-Fi programming at the time, and they also take the opportunity to tell you what’s coming up next (in this case, Fright Night 2), but still, it’s nice to see that even in that little itty bitty way, MST3K was still on Sci-Fi’s radar. Kinda. While on the subject of advertising, thus far this has been more of an episode review. Which is fine, because after years of hoping and praying, it was finally released officially in the Volume XXXI Turkey Day DVD set. I probably wouldn’t put 912 in my top 10 favorite episodes ever list, but I do like it plenty. Top 20, maybe. However, this article is supposed to be about the larger broadcast picture. Sure, the episode itself is the main point, but what definitively places things in a certain time and place are the commercials. Just like my other ‘broadcast recap’ posts, I like to finish up with a look at those. Hey, you all remember Stargate SG-1, don’t you? Sure you do! After all, it was only on for about 47 years. It was about MacGyver and a guy with a Dodge Ram logo on his forehead going through adventures in outer space or something like that. Easy SG-1 fans, of course I jest. It was actually a pretty good show, at least what I saw of it when it was in syndication (around here it was WJW TV-8 on weekend afternoons, if I recall correctly). This promo, obviously, spotlights the show after new episodes were moved from Showtime to Sci-Fi. As for Code Name: Eternity, never saw it. Apparently it was a 1999 Canadian series that only ran a season and then showed up on Sci-Fi. Ain’t I helpful? I had almost completely wiped this series of ads from my memory. BarNone Auto Loans are still around, and at the time they had a line of commercials featuring a dog sock puppet (apparently originally a Pets.com mascot, though I really have totally forgotten all about that hoopla) pitching the company. So, yeah. This one spotlights (see what I did there HAW HAW HAW) Office Max’s special brand of highlighters, and centers around one employee’s convoluted “too sick to work” scheme, which fails spectacularly. At least I think that’s plot of the commercial, I didn’t bother to save it to the PC and I refuse to go back and check. I’m pretty sure that’s what it’s about. Geez oh man, it can be hard to realize that Geico’s Gecko has been around for basically forever at this point. I also find it troubling that I can tell his accent is slightly different in this ad from what it is nowadays, even though I’m hardly a Geico Gecko expert. In this installment in the long running series, a boy sleeps while his two robot toys prepare to duke it out. That is, until the Gecko steps forward to pontificate about Geico, much to the amazement of said toys. 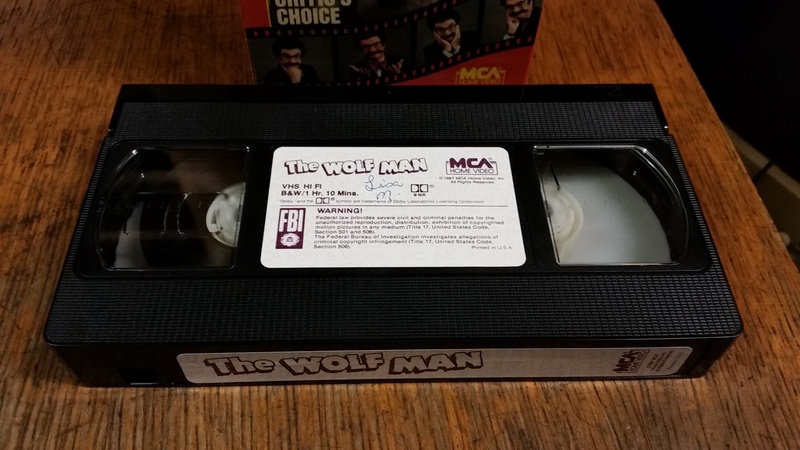 Yes, they were still releasing commercial movies on VHS in 2004. That wouldn’t last a whole lot longer. My reasons for including this one have less to do with the movie (I have never seen Cabin Fever nor do I have any interest in seeing Cabin Fever) and the odds were good that I would have ended up skipping this one entirely (a fate that befell a Burger King ad featuring Steve Harvey trying to come up with a combination name for “sandwich” and “salad”), until I realized it starred Shawn from Boy Meets World. Though, that’s really all I have to say about it. So, thank my TGIF nostalgia for this entry, I guess. Hey, a commercial I can almost get excited for! I say “almost” because aside from the very first installment for NES, I have never played a Final Fantasy game. And, since I generally don’t care for most RPGs, I really have no interest in even that one. In other words, I haven’t played Final Fantasy Crystal Chronicles and you can’t make me. HOWEVER, the poor Nintendo Gamecube, while maintaining a cult following, was basically getting clobbered by Sony’s Playstation 2 and Microsoft’s Xbox at the time. Since Final Fantasy is indeed a big name in the game world, it was nice to see it show up on Nintendo’s underrated console; from a sales-standpoint, it needed all the help it could get (that’s not a slam, either; I had a Gamecube, still do somewhere in fact, and it was definitely a lot of fun, but the system really was an object of derision among most of my PS2-owning friends, which I think was representative of teenagers in general). At any rate, old video game ads are always a nice example of the time in which they were broadcast. So, 2004, Gamecube, there you go. Found during the final commercial break of the broadcast, this was a short promo for what was coming up next on Sci-Fi. Fright Night II (hey, it was listed as Fright Night 2 before!) 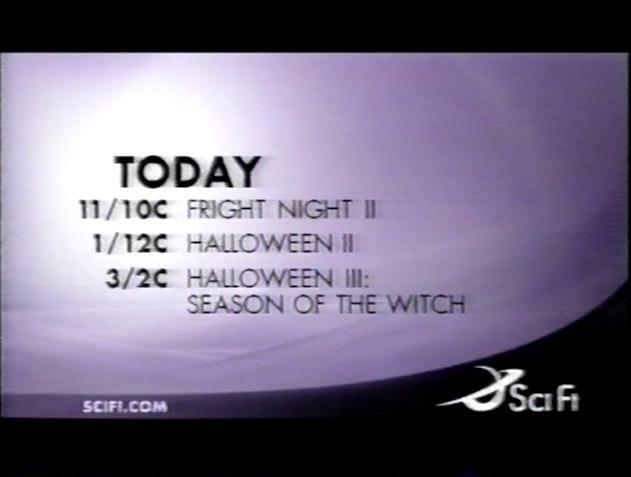 and Halloween II & III would take you up through midday that Saturday. While I’ll never claim to have much interest in any of those films, does Sci-Fi even play movies like them anymore? Of course it’s “SyFy” nowadays, but at last check (and it really has been awhile), it was all homemade SyFy exclusives and whatnot. Then again, I don’t watch the station anymore, so what do I know? 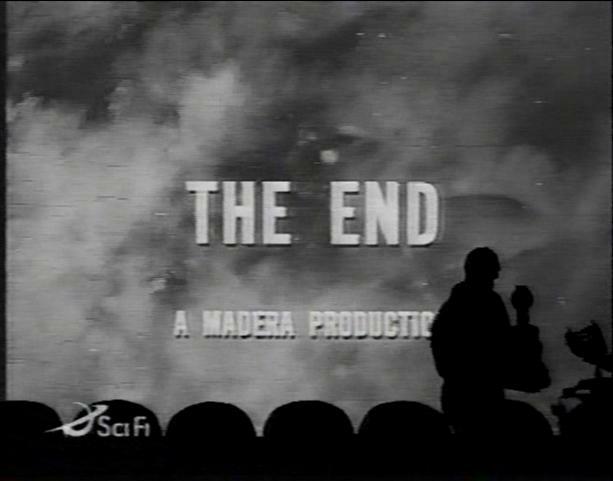 And so, Mystery Science Theater 3000 came to an end on the Sci-Fi Channel. Never has a show-ending stinger felt so bittersweet. We had our tapes, we had our DVDs, but what we didn’t have was knowledge of when or if we’d ever see our favorite show being broadcast again. A lot of the “specialness” of this recording has dissipated over the years, but for once, this is a good thing. We MSTies have been given what could be described as the royal treatment. MST3K has been making a comeback on actual TV, the DVDs are profuse, and most of the people involved with the show are still out there cranking out the comedy in various forms. Still, it’s a tape that captures that moment in time when a lot (but not all) of that was still up in the air, and for that, I’m glad I still have it. Plus, you know, it’s a good episode I like to watch every now and then. Kinda easy to forget that when I’m busy pontificating about (real or imagined?) specialness and whatnot. Man, that image above still brings a tear to my eye. Figuratively, I mean. After all, it’s just a show, I should just relax and all that jazz. 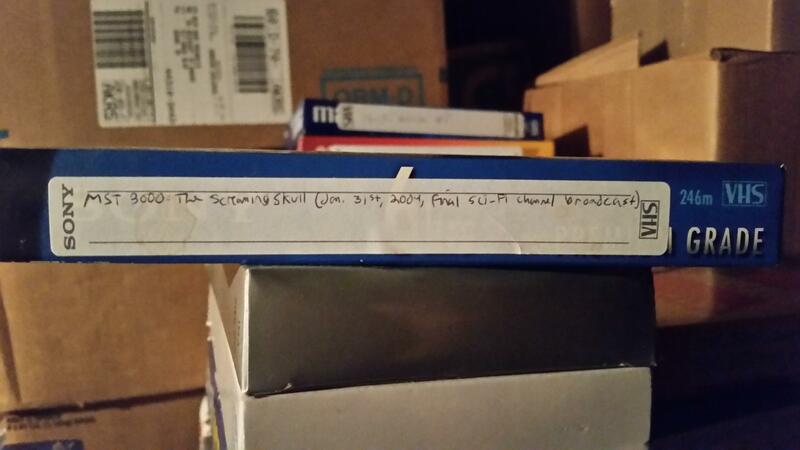 This entry was posted in Uncategorized and tagged 2004, 912, 912 the screaming skull, ad, advertisement, airing, article, beta, beta tape, betamax, broadcast, bumper, cassette, channel, comedy central, commercial, commercial break, DVD, episode, episode 912, episode review, final airing, final broadcast, final episode, gamecube, intro, january 31 2004, joel, joel hodgson, joel the bots, ktma, ktma 23, last airing, last broadcast, last episode, local, mike, mike nelson, mike the bots, mst, mst 3000, mst3000, mst3k, mst3k 2004, mst3k sci-fi, mystery science theater, Mystery Science Theater 3000, mystery science theatre, national, nintendo, nintendo gamecube, outro, overview, post, promo, recording, review, robots, sci-fi, sci-fi channel. scifi, series finale, station, syfy, tape, teaser, the sci-fi channel, the screaming skull, trailer, vcr, vhs, vhs tape, video, video cassette, video tape, videocassette, videotape on July 8, 2015 by neovideohunter. While digging through my junk collection recently, I found this old VHS of the public domain 1940s Superman cartoons. Not so odd in and of itself, I come across these kinds of tapes while out and about all the time, and I’ve got more than enough of them in my collection as it is. But, what’s interesting about this particular release is that it’s a Spanish edition. Also, it’s sealed brand new. Also, I have zero recollection of ever buying it. What probably happened is I bought a bunch of tapes or otherwise interesting items at Goodwill or something, I found this tape while there and threw it in with the rest of my stuff, and subsequently forgot about it because something else I picked up in the haul was more exciting. 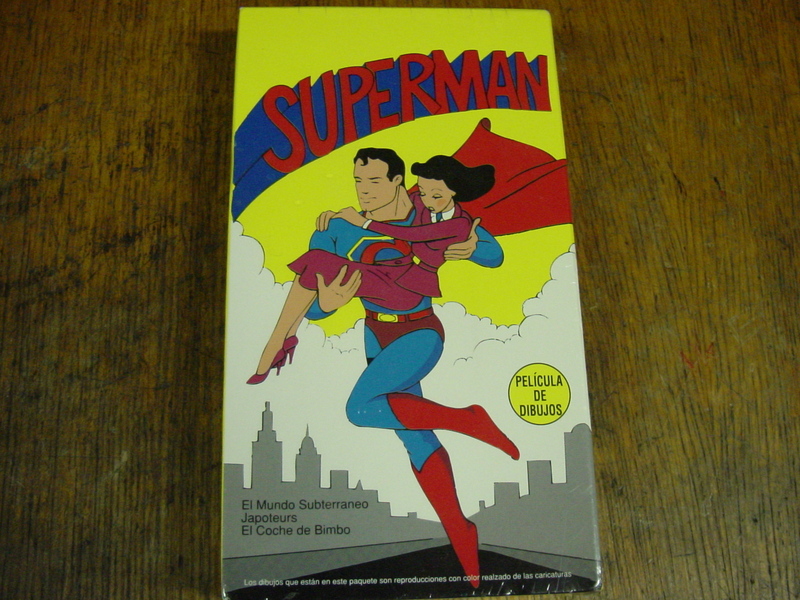 That has to have been what happened, because I’d like to think under normal circumstances, I’d have some recollection of a sealed Spanish Superman (alliteration) VHS tape in my collection. I can’t bring myself to open it. Most likely the cartoons within are the regular English versions found on any number of cheap VHS releases; I highly, highly doubt these are Spanish-dubbed. So why bother? There probably won’t be any notable differences between the content of this tape and the standard U.S. releases I’m more accustomed to. Plus, if I leave it sealed, I can stomp around and act all superior to everyone else because my Spanish Superman tape is still minty brand new. Right? This isn’t the first time I’ve babbled about budget Supaguy tapes; back in February 2014, I looked at this ostensibly obscure release. This Trans-Atlantic tape is actually more typical of most similar releases, except for, you know, that whole Spanish language box thing. The front cover artwork, while clearly ‘homemade,’ is decidedly more competent than a lot of budget Superman videos, and make no mistake, in this peculiar field, that’s no small accomplishment. Look at that: the standard disclaimer about the images on the box being “color enhanced” and taken from the actual cartoons on the tape is apparently universal. Most budget cartoon tapes had a similarly-worded disclaimer. I assume “color enhanced” really means “redrawn” or something along those lines, probably to avoid any legal hassles. And in the case of Superman, you do not want to be taking any chances with that property. I can’t even begin to speak Spanish in any adequate sense, but I can still figure out what a good deal of the wording on the box means, and for what I can’t figure out on my own, this helpful online translator keeps me from looking like a total doofus. The yellow bullet point by Supe’s foot roughly translates to “animated films,” and it looks like the cartoons included are The Underground World, Japoteurs (“Gee, ya don’t say? !”), and what I can only surmise is an old Bimbo (as in Betty Boop’s canine boyfriend, weird relationship though that was) cartoon as filler, which really wasn’t too unusual with video releases of this type. According to the translation site, El Coche de Bimbo roughly translates to “Bimbo’s Car,” so you figure out what the hell cartoon it actually is if you need to know that badly. Stop trying to make me open my tape. Also apparently universal: the fairly plain-Jane back covers of these releases. Doesn’t look like there’s anything specific to this Superman tape in the description on the back; from what I can tell, there’s the standard disclaimer about these all being public domain cartoons. 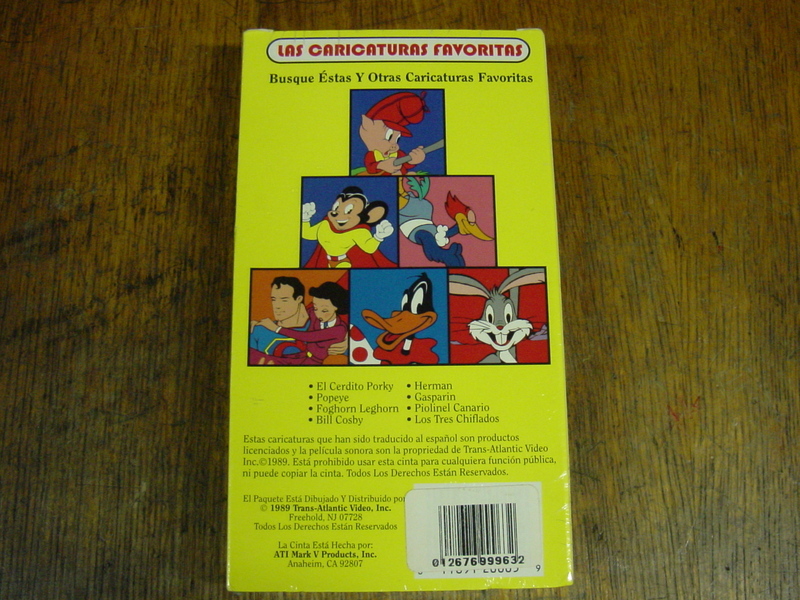 Plus, the listing of other cartoon tapes from the company. I have no idea what “Bill Cosby” could refer to; Fat Albert was never public domain, was it? I totally want a Spanish Popeye tape now. 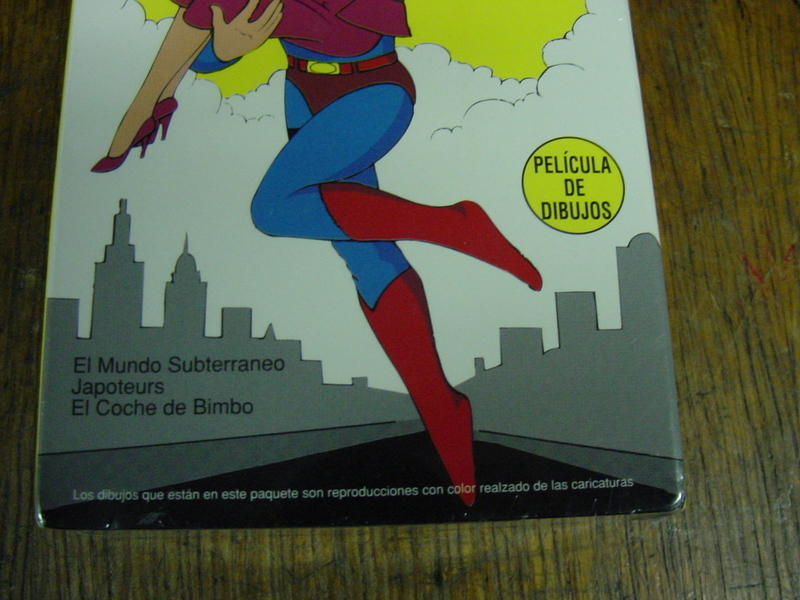 Maybe I’m not giving a wholly accurate picture of this tape: while it is indeed a Spanish release of 1940s public domain Superman cartoons, this probably wasn’t something you’d actually have to leave the country to buy; more likely, it was sold in the U.S., but specifically in Spanish stores/neighborhoods. My case is only bolstered by the fact that I found it around town at all, as well as the fact that, according to the box, it was manufactured in the U.S. So, while the tape may not be that rare/unique/whatever, considering it’s not the sort of thing I myself come across all that often (relatively speaking), well, that puts it one-up on the usual fare I’m forced to contend with on a consistent basis. After you see variations of the same thing some 100,000 times, it doesn’t take much to stand out. It’s a cool video, and one I’m certainly glad to have. I just wish I could remember where the hell it came from. This entry was posted in Uncategorized and tagged 1940's, 1940s superman, 1940s superman cartoons, 1989 superman cartoons tapes, 1989 vhs, 1989 video, animated, article, beta, budget, cartoons, cheap, famous studios, famous superman, fleischer studios, fleischer superman, mexican, mexico, obscure, off, overview, public domain, public domain superman, public domain superman budget tape, rare, release, review, spain, spanish superman, spanish superman cartoons, spanish superman cartoons tape, superman, superman cartoons, superman cartoons tape, tape, trans-atlantic video, vhs, video, videotape on March 31, 2015 by neovideohunter. I haven’t talked much about Fritz Lang’s 1927 Metropolis on this blog, but in the league of my all-time favorite films, it is way, way near the top. I like a lot of movies, but we’re talking a top five’r, here. 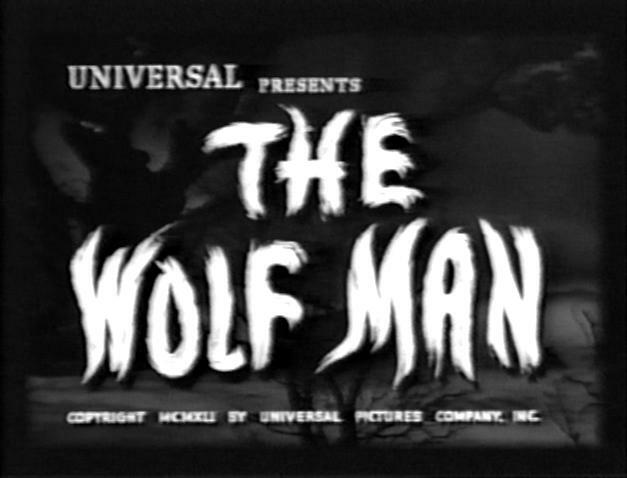 Not only is it a genuine silent masterpiece, but it’s also a movie I just never get tired of. Kino’s 2004 DVD release of a terrific restoration and, even better, their 2010 DVD and Blu-ray release of a virtually complete version have obviously made earlier editions obsolete, but during the VHS-era, there were a myriad of different releases of the film, exacerbated by a public domain status (that apparently no longer holds). Needless to say, this Crown movie Classics edition (undated, but almost certainly from the mid-1980s) is one such release. 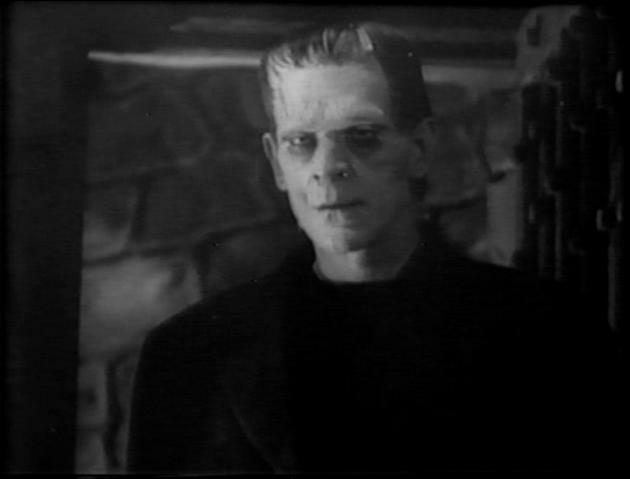 Y’see, following the original 1927 theatrical release, for various reasons the movie almost immediately began being cut down, the end result being that for years the complete original cut of the film was considered lost, and by the time of the home video era, there were a ton of differing prints out there, in varying degrees of quality and completeness. Barring few exceptions, most of these releases weren’t all that good, suffering from poor print quality, incompleteness, and so on. By the late-1990s/early-2000s, the conventional Metropolis wisdom was that the two best releases to have were 1) the then-out-of-print Vestron Video release of the 1984 Giorgio Moroder restoration, which for all of Moroder’s tampering (modern tinting and effects, subtitles instead of intertitles, a then-modern rock soundtrack, even a few newly-filmed bits), had beautiful print quality and more scenes restored that any other version up to that point. It was a polarizing restoration, for sure, but just from a viewable footage/coherent story standpoint, it was worth the high prices used copies were regularly commanding on Ebay at the time (it has since been released on DVD and Blu-ray). 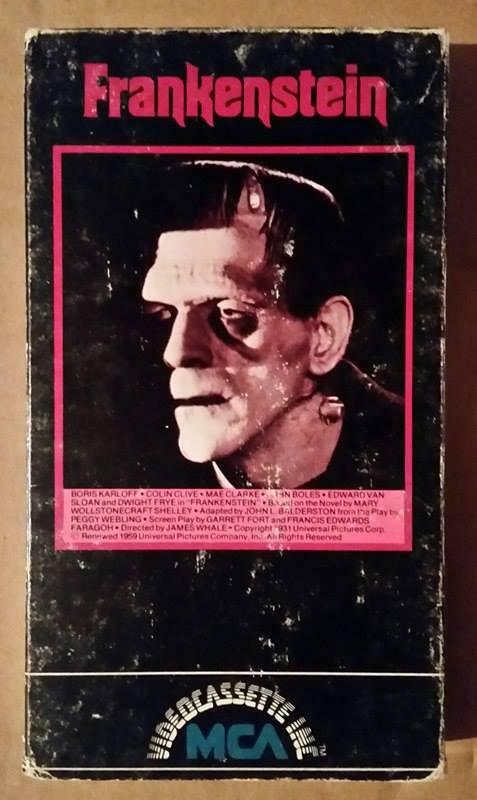 2) The 1989 Kino VHS release. It wasn’t as complete as Moroder’s, but it was absolutely the best ‘traditional’ version of Metropolis out there, in glorious black & white and fantastic print quality. The only downside was a semi-jazzy soundtrack that didn’t fit all that well and actually dragged the whole film down. Nowadays, it’s easier than ever to find a good print of the film (and make no mistake, for years the quality of a print made all the difference as to whether a viewer ‘got’ the movie or not), but back then, Moroder and Kino were the ones to go after. The thing was, by the late-1990s/early-2000s, the Moroder version had been out of print for years, and while it was readily available used online, the popularity frequently made prices range from $30-$60 (depending on condition) for the VHS release, and if you wanted the Laserdisc edition, you were going to have to really pry open the wallet (contrary to what many claimed, the VHS was never that rare, just very highly sought-after, but the Laserdisc was a whole different story). And, to make matters worse, the ’89 Kino VHS was becoming increasingly harder to find around this time, too. Over time, these tapes began costing more and more to acquire, but they were worth the effort, because while neither was perfect, they were the only ones to do Metropolis any kind of justice in the home video market (in regards to the mainstream home video market, I mean; there were probably some specialty mail-order retailers that released decent VHS editions, but most people shopping in the video stores never saw those kind of copies). So, besides Moroder and the 1989 Kino VHS, there were tons of varying video releases out there, and the differences between them could be pretty drastic. 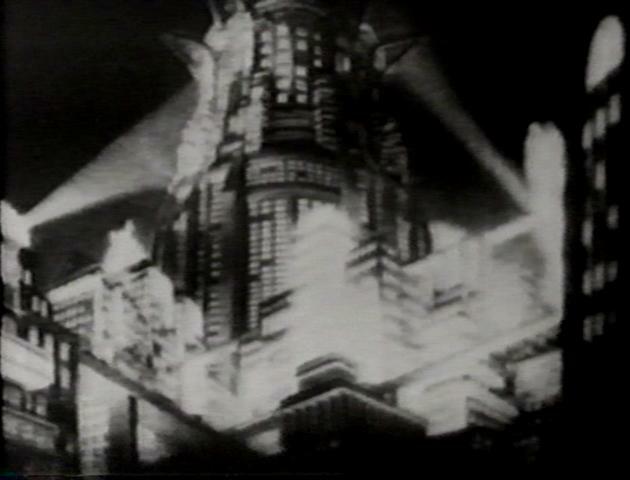 Metropolis had long since attained “legendary film” status, and with the movie then in the public domain, it was an easy target for low-budget releases. Many (most?) people may have been satisfied picking up one of these releases and calling it a day, but personally, after acquiring Moroder’s (and having already had a bargain-bin version), I began buying as many variants of the film as I could come across. Sure, most of them were crummy, but it was actually kinda fun to see how they differed from each other. From quality to beginning/end cards to soundtracks to completeness, they could vary wildly from one copy to the next. I still have all of my different VHS copies I’ve acquired over the years (in a box dedicated almost entirely to just Metropolis), and while my collecting has become more sporadic in recent times, I do still pick up obscure releases or ones I otherwise haven’t come across before, even though it goes without saying that I own all of the new, definitive restorations. 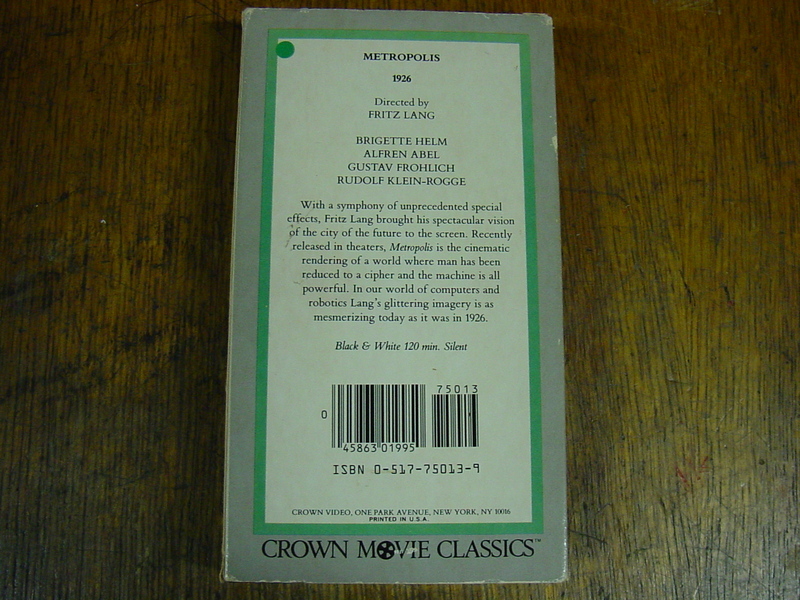 And that brings us back to the Crown Movie Classics VHS (remember when this article was supposed to be about it?). Oddly enough, despite my being aware of it for years through online searches, this Crown Movie Classics release is actually a newer acquisition of mine. In this day and age it’s not particularly rare, maybe uncommon at best, but much to my surprise, it’s one of the more interesting video releases from the era. As previously stated, there’s no date anywhere on this tape, but the mention of it being released in theaters on the back of the box (they probably should have said “re-released,” but I nitpick) points to around 1985. Giorgio Moroder’s 1984 release wasn’t just a great restoration, it also brought the film back to movie theaters, which is almost certainly what the summary on the box is referring to. My own quick synopsis: Metropolis is a seminal silent sci-fi (how’s that for alliteration?!) classic from Germany, enormously influential, not only in the science fiction genre, and not only in silent films, but in film making period. Falling into the German expressionist category, it details a futuristic city in which the rich and privileged live in a towering city above ground, while workers keep the city running through endless manual labor below ground. Plotlines involving the son of the man who runs the city, a girl from below ground who wants to unite the two classes of people, a robot created by a mad scientist, as well as some simply phenomenal special effects that are still impressive, it all combines into a not only a terrific sci-fi movie, but one that works as a social allegory, even today. Not only was Metropolis ahead of its time in many ways, it’s also still frighteningly prescient. That’s an extremely streamlined rundown of the film, which is intentional. My reasoning? if you’re reading this article, there’s a good chance you are already familiar with it. 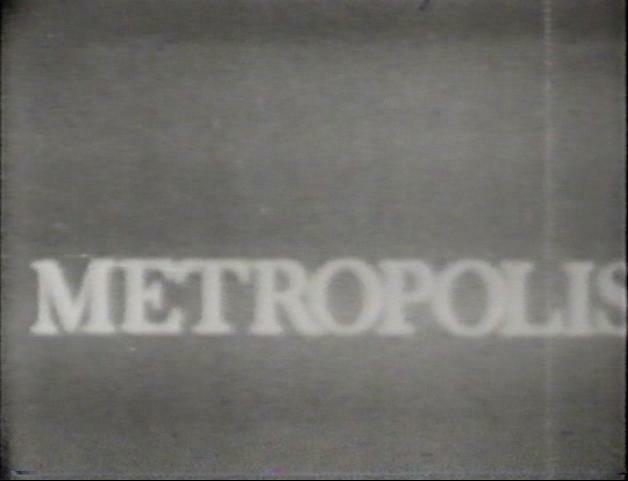 However, if by some chance you haven’t seen Metropolis and are reading this, go watch it. Nothing can replace experiencing this film for yourself, even more so now that we have practically the complete film restored and available. I first actually saw the movie in the summer of 1998 (July 4th or thereabouts, as I recall), when I found a budget video release of it at Best Buy, back when their budget VHS sections could yield untold numbers of “good stuff.” Metropolis played into my love of both sci-fi movies and silent movies, so it was a no-brainer purchase. Unfortunately, the tape I bought was the version released by Madacy, which unbeknownst to me at the time was widely considered one of the worst versions to have. 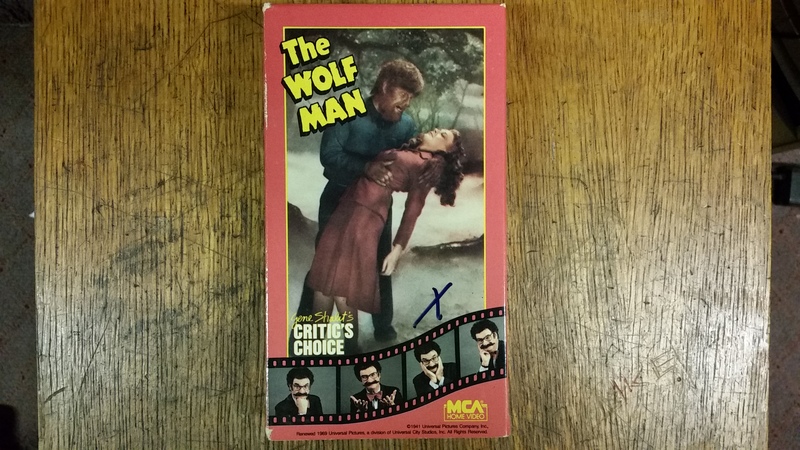 Madacy, who were no strangers to such things, repackaged this particular print endlessly in the VHS era, and in the late-1990s it was by far the most commonly found edition. Combining abysmal print quality and a score comprised entirely of classical music with no attempt whatsoever to sync it with what was happening on screen, well, it wasn’t exactly Metropolis as it was meant to be seen. While I appreciated the film for what it represented and the achievements it made, truth be told, it wasn’t until I caught a TV broadcast of Giorgio Moroder’s 1984 restoration that I truly fell in love with the film, and I’ve been there ever since. One thing about collecting Metropolis: the more differing copies you’d get, the more you’d start running into the same prints over and over again after awhile. I’ll explain more in a bit, but that aforementioned Madacy release actually shares some heritage with this Crown Movie Classics one, though one isn’t a carbon copy of the other. Read on, you’ll see. 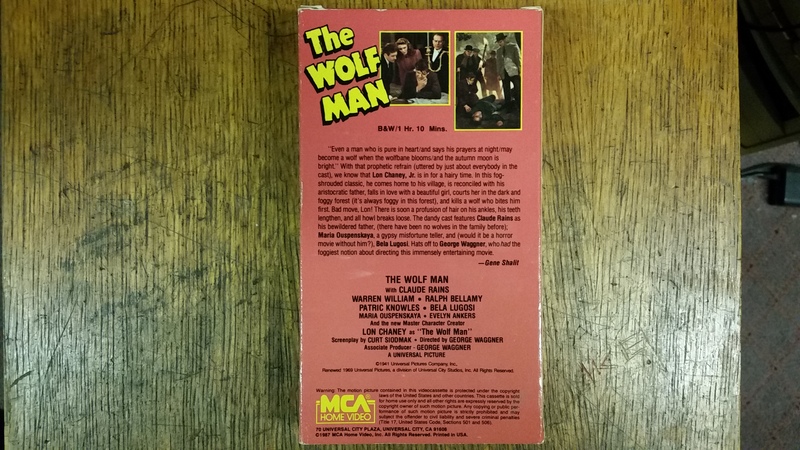 Ignore both the 120 minute running time on the back of the box and the 139 minute running time printed on the tape’s label, because the movie as found here only runs about 95 minutes. Not so unusual, since the running times of these earlier, lower-budget VHS releases generally ranged from 90 minutes to 120 minutes. The running times were rarely a gauge of how complete a respective print was, though; rather, this being a silent, the speed at which the film was run varied from version to version, and that more than anything dictated the total running time of a particular release. Also, this release is recorded in SP, which of course is preferable to the EP and LP recordings of a good many other copies out there at the time. W-w-what’s it say?! The various problems of this release are immediately evident as soon as the movie starts. The introductory card is so blurry, it’s basically unreadable! This does not inspire confidence in the product that’s to follow. 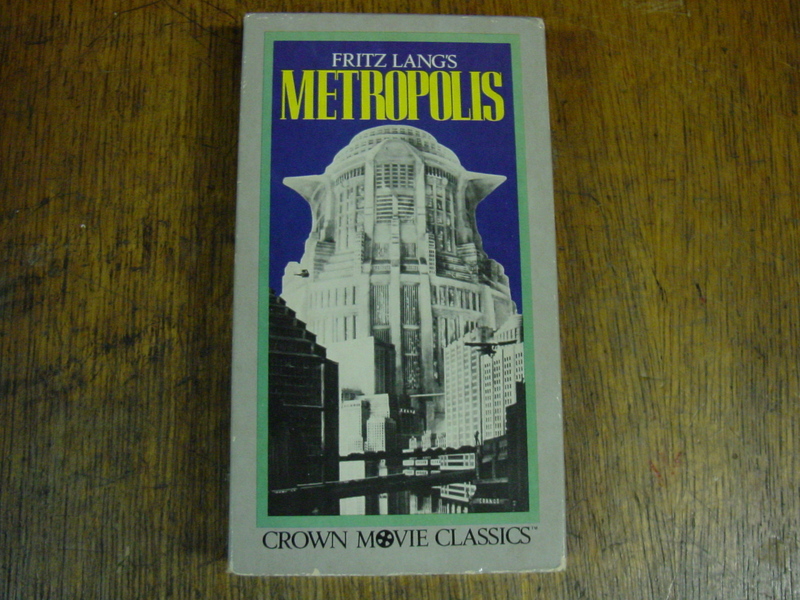 As I mentioned, this Crown Movie Classics VHS actually has quite a bit in common with that old Madacy release that was my first Metropolis. It clearly comes from the same source, though the two are hardly identical. Because Madacy’s was such a widely distributed version, comparisons between the two are, for me, inevitable. Madacy presented one of the worst prints out there, but Crown Movie Classics’ release, well, it’s not exactly good either. The picture quality is uniformly terrible; blurry, washed out, off-center (just look at the title above! ), it’s pretty rough going. Madacy’s version was pretty terrible looking, too, though I’m honestly I’m not sure which is worse here. Both present pretty poor versions of Metropolis. I never thought I’d say it, but based solely on that introductory text we saw, I may have to give the edge to Madacy as far as better print quality goes! At least the intro was kinda readable in that one! Besides some editing differences, the chief example of which you’ll see in the next screencap, Madacy’s took the beginning cards, end card (in fact, Madacy’s end card looks to be some modern, cheesy cartoon-like thing; it’s completely different from the one on this tape) and intertitles and freeze-framed them, ostensibly so they’d be more readable. It ends up looking incredibly cheap, especially with all of the dust and scratches frozen in the frame. Crown Movie Classics’ version, however, leaves all of these unchanged, which if nothing else looks much more natural. Soundtracks: Madacy decided to use random classical music with no connection to what was happening on-screen. Crown Movie Classics, on the other hand, used a soundtrack that seems like it would be more at home in a Laurel & Hardy short than Metropolis. It’s almost funny to hear happy-go-lucky music during some of the more dramatic scenes in the movie, except that it’s effectively taking you out of a scene instead of drawing you into it. Like the print quality, I can’t really decide which is the worse soundtrack, though I think I’d take Crown Movie Classics’ over Madacy’s…by a hair. For as crummy as the print quality and soundtrack are, there is a factor that, believe it or not, puts this version of Metropolis above most others on the market from the mid-1980s up through the 1990s, and you’re looking at it above: it’s the “stadium scene,” one of the hallmark “restored scenes” found in Moroder’s restoration. It wasn’t exactly exclusive to that restoration, but it turned up so rarely in other home video versions that it might as well have been. It’s not really a long scene, just a fairly short moment of some of the upper-class citizens having a quick race at the start of the film. It’s placement in this print is a bit out of order from where it should be, and quality is so poor that a first-time viewer would be forgiven for not knowing what exactly was going on, but the fact that it’s here at all is a pleasant surprise. It’s amazing how stuck-in-2000 my Metropolis sensibilities are, because I got pretty jazzed upon finding this scene in this VHS release, even though I already have, you know, the complete restoration of the movie on DVD. 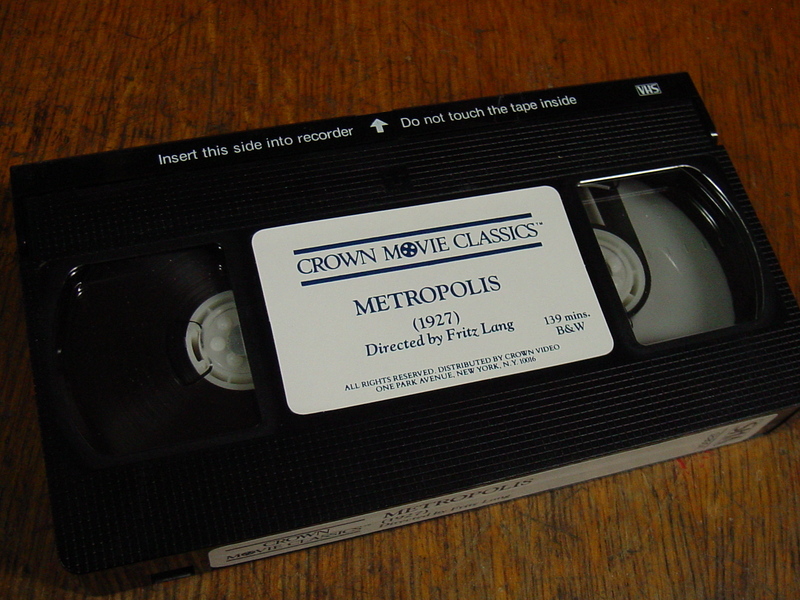 When DVDs were just starting to take off in the late-1990s, Metropolis began finding a presence in that format just as it had on VHS. But for a time, there were only two real DVD releases out there: Madacy’s, which was just a DVD version of their poor VHS, and one put out by a company called Classic Media Holdings, which was the same print as this Crown Movie Classics VHS – except the picture quality was infinitely better (I have a copy somewhere, but I don’t remember if the soundtrack is the same or not). Until the 2004 Kino release, it was really the best DVD version out there. It came out around 1998/1999, and by 2001, it was out of print and not easy to find. When a copy did turn up on Ebay, it went for pretty big bucks (in the summer of 2001, a copy popped up there, and I had a pocket full of dough from my recent grade school graduation party; it still wasn’t enough to win the auction. We’re talking well over a hundred bucks here. I finally got a copy some years later, though truth be told, it wasn’t much cheaper). The relatively excellent picture quality was certainly a selling point of the DVD release, but this stadium scene, this one little short scene that happened to be included, was also a big part of that. Which brings me to this point: if someone, back in the glory days of the late-90’s/early-2000s Ebay when these types of tapes were actually selling, had listed a copy of this Crown Movie Classics edition and specifically mentioned this stadium scene, preferably in the auction title, there’s a good chance that not only would they have made a sale, they also would have made a bit more money than usual. That’s how starved some Metropolis fans (myself included) were for better, more unique, more complete versions of the movie at the time. And despite sharing the same source, no, this scene is not in the Madacy release. There are some scenes that, no matter how terrible the print and/or sound quality are, that remain amazing. Despite the blurriness of the picture, the early scene of the underground workers walking zombie-like to work is unbelievable. The machine-like dehumanization of the scene is unmistakeable, and it has become one of the defining images of Metropolis. Ditto for the scene in which the scientist Rotwang (save the snickering, please) gives the image of heroine Maria to his robot. 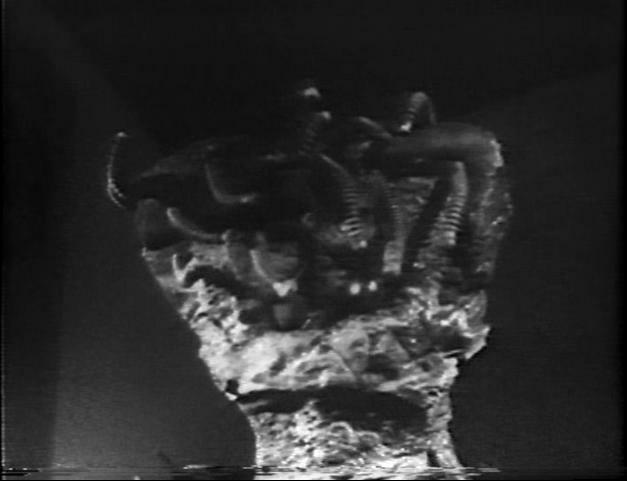 The special effects used, particularly as the persona is being grafted to robot (consisting of animated rings moving up and down the robot and growing progressively in number), is remarkable for a 1920s film. The print quality obscures many of them in this version, but the panoramic shots of the city itself are still pretty awe-inspiring. 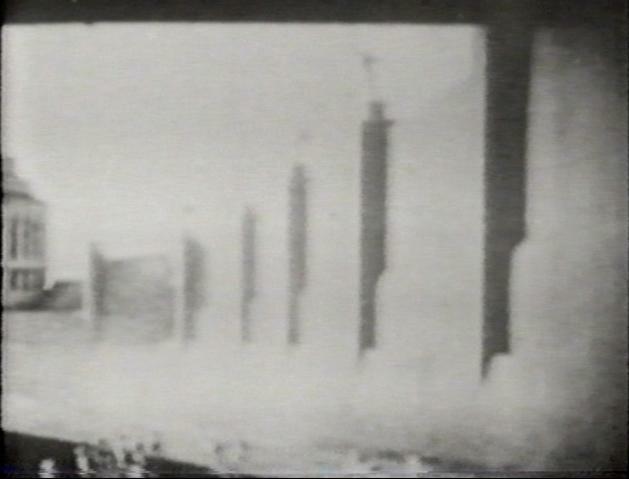 According to legend, the various shots of the city were inspired by the towering skyscrapers of New York as Fritz Lang first entered the city via boat. The inspiration shows time and time again in Metropolis. 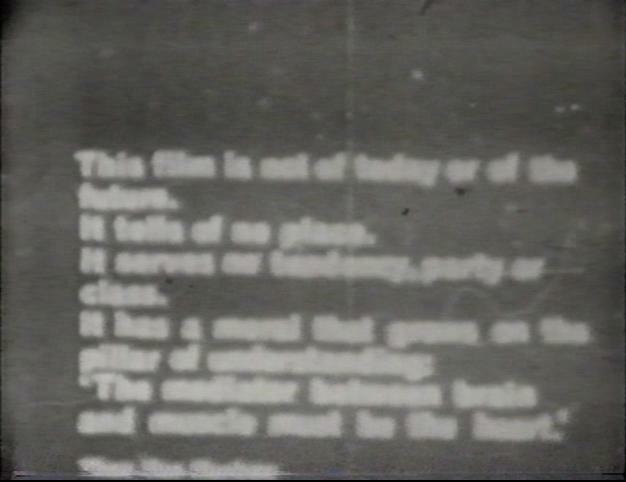 Even though you almost can’t read it, according to the end card, this was a Thunderbird Films release. I don’t know when they first put out their version of the film, but they released a lot of movies like this. I’m pretty sure I have a copy of Buster Keaton’s The General by them somewhere. Or maybe that was Blackhawk Films, I don’t remember. 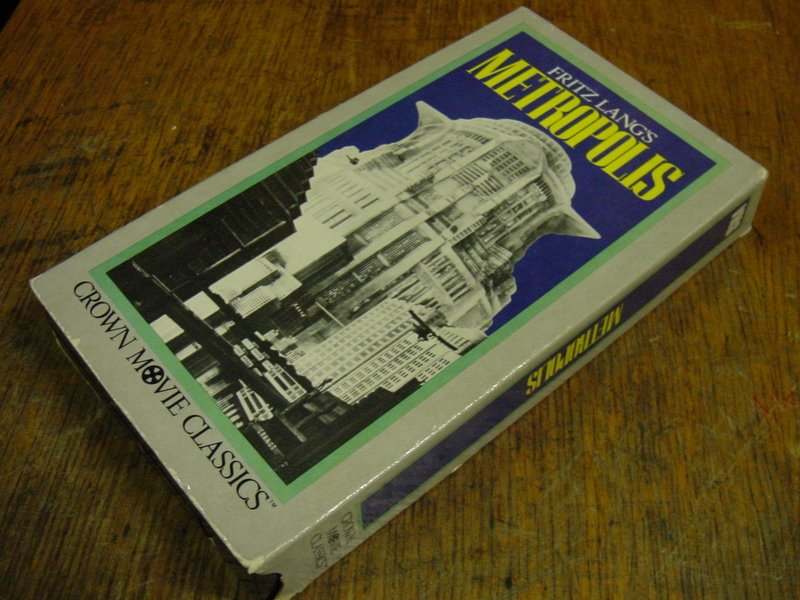 It’s not really a ‘good’ version of Metropolis, but it is an interesting one. In fact, for those curious to see one of the cheaper, varying prints of the film out there when there wasn’t (much) better available, well, I guess you could do worse. The abysmal print and sound quality, clashing with the more-complete print (relative to other similar releases), the whole thing is entertaining in spite of itself. Though, to be fair, Metropolis is such a monumental film that even these old, disrespectful prints, despite trying their best, can’t completely hide what a masterpiece the movie is. If nothing else, it’s worth having just to see what fans by and large had to put up with in the home video market until things were more widely done right by Fritz Lang’s classic. Geez, there’s an essentially complete DVD/Blu-ray release out there, and I just spent 47 hous talking about an incredibly obsolete VHS version. I have, how do you say, too much time on my hands. This entry was posted in Uncategorized and tagged 1925, 1926, 1927, article, beta, classic, complete, crown movie classics, early, early release, early sci-fi, early science fiction, early vhs, edition, film, frita lang's metropolis, fritz lang, fritz lang metropolis, genre, incomplete, issue, kino, metropolis, metropolis review, metropolis sci-fi, metropolis silent sci-fi, movie, old, overview, print, release, restored, review, robot, sci-fi, sci-fi film, sci-fi movie, science fiction, silent, silent classic, silent film, silent sci-fi, silent science fiction, unrestored, version, vhs, video, vintage on February 24, 2015 by neovideohunter. I love this one. Love love love it. No matter how many times I type “love,” I doubt you’re going to understand just how happy I am to have this awful, awful movie on a format that’s only slightly more obsolete than VHS. I’m jazzed, man. Why? Because I’m a complete and total sucker for The Creeping Terror. I love this stupid terrible movie beyond what is probably considered acceptable limits of, erm, acceptability…? That kind of fell apart, but suffice it to say, I’m quite fond of the flick. It’s one of the worst movies ever made, and it’s gloriously entertaining because of that. The Creeping Terror has it all: shoddy black & white footage, limited dialogue but plenty of awkward narration, a star that you won’t buy for a minute as a legitimate star and who doesn’t really do enough to warrant being called a star anyway (but being the director/producer/guy who made this movie happen, naturally he had first dibs on leading man-status), a scientist played by the original Marlboro Man (yes, really), a random lecture on bachelor-hood and married life, a very slow-moving monster that looks to be made of shag carpet, victims that not only lack the ability to run or even walk away from said monster but who also crawl into the damn thing, a rather rotund man and his grandson Bobby (“Bobbbby!“), and the most awkward, goes-on-for-far-too-long dance party that you’ve ever seen. It’s one “say what?” moment after another, and thus it’s clearly one of the worst (greatest) things ever committed to film. Fittingly, it was given the Mystery Science Theater 3000 treatment, but the movie is so, so out there that it’s a trip by itself. I first saw (and taped!) the film in 1998 on WAOH TV-29, years before I saw the MST3K version, and it was the recording of that broadcast that I was most familiar with for years (rarity of rarities: Unlike most of the stuff I taped, I actually wound up watching it!). My reasons for taping it were two-fold: 1) at that time, any old horror/sci-fi flicks were fair-game for my vicious recordin’ tactics (that is, I’d tape anything and everything possible that fit my preferred criteria), and more importantly, 2) thanks to my beloved Mystery Science Theater 3000 Amazing Colossal Episode Guide, I knew the movie had been featured on the show, and even though it would be a few years before I became familiar with the actual episode, the mere fact that the movie was on the show was enough to make me want it. That said, despite the extreme oddness of the film, it didn’t really do much for me then. Sure, it was an uber-amateurish, grade-z sci-fi flick, but I had plenty of those in my collection already (albeit few, if any, as inept). And while the MST3K treatment has since become one of my favorites, my first viewing of that episode several years after first seeing The Creeping Terror left me a little cold as well. It wasn’t until almost 2 years ago, when I came across this thread at the Classic Horror Film Board, that my interest in the film rose to peaks I never thought it would. The thread started way back in 2006, and it’s still going! There’s so much interesting backstory regarding The Creeping Terror that the movie itself is almost (but not quite) overshadowed by it all. And since I stumbled across the thread after it was already well, well underway, it was simply amazing to watch as more and more info about the film was progressively revealed. The contributors to that thread are some of the most knowledgeable and downright cool people I’ve come across online, and the sheer amount of information I’ve learned from not only that thread but from that forum in general is something I’m certainly grateful for. If you don’t know how The Creeping Terror came to be (and I sure didn’t), you owe it to yourself to check the thread out. It’s an absolutely fascinating read. Indeed, that thread is how I learned of the VCI home video release in the first place. 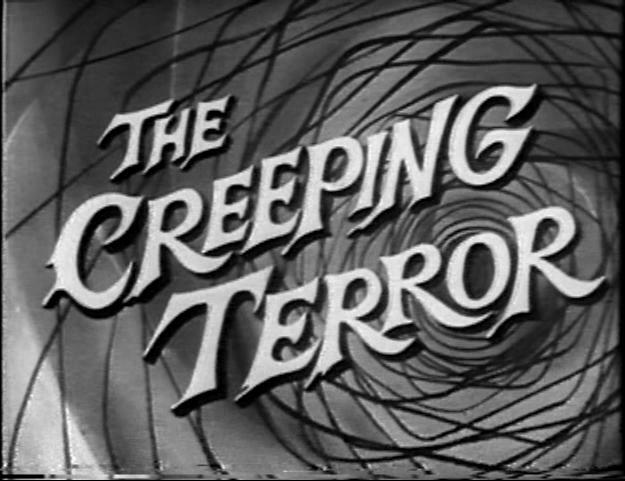 Prior to that, The Creeping Terror is a film I had figured as incredibly public domain. That is, there was endless VHS/DVD releases of it out there, be it standalone or in compilation sets, not unlike The Brain That Wouldn’t Die. I’m not sure how I got that idea in my head, because while there were a few VHS releases, as well as a few DVD compilations nowadays, it turns out The Creeping Terror is not only not in the public domain, it also never had much of a life in the home video market, either. 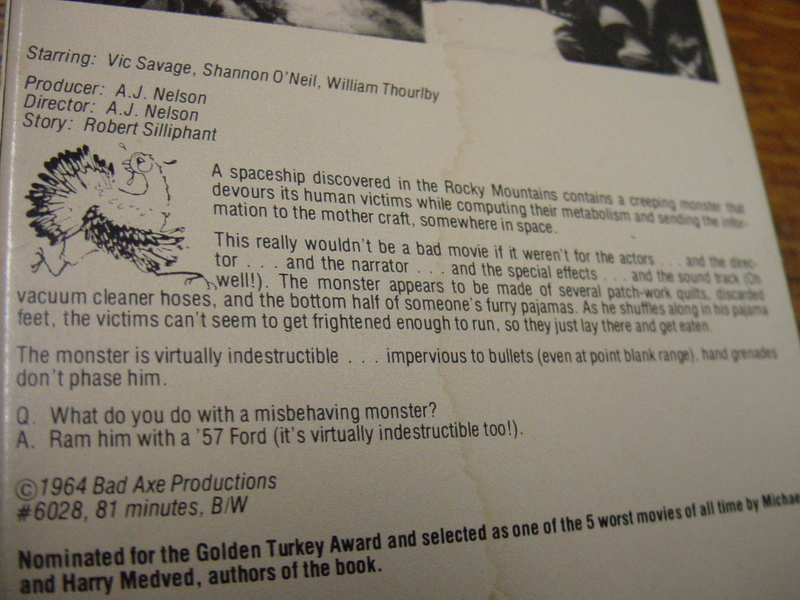 There was apparently a Rhino VHS release in the late-1980s/early-1990s, and of course the MST3K version on both VHS and DVD, but as far as I can ascertain, the VCI release under their “Le Bad Cinema” banner from the early-to-mid-1980s (there’s no video release date anywhere on my copy) was the first. Maybe it wasn’t, but as far as I can tell it was. Either way, in short order the VCI release became one of my “most wanted” videos. I tend to operate under a “sooner or later I’ll come across it” optimism. Not just with videos, but also with old broadcasts/commercials/etc., electronics, and so on. And time and time again, that optimism and patience has paid off. But, it’s not fool-proof. For example, even though I’ve had a copy for years (two copies, actually), I still haven’t come across the Vestron release of Giorgio Moroder’s Metropolis in person; I had to resort to Ebay back in the day (luckily, it’s out on DVD now). 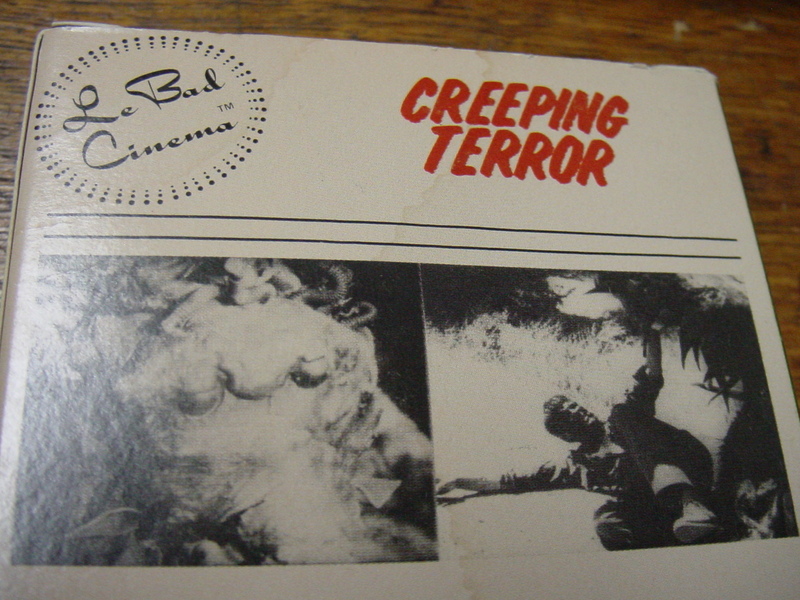 Considering VCI’s The Creeping Terror is far, far more rare than that video ever was (Moroder’s Metropolis used to go for big bucks on Ebay because it was, at the time, the best restoration of the film, but there were always multiple copies for sale; even though it was out of print, it was really more popular than outright rare), I knew my chances of finding a copy “in the wild” were slim, though certainly not impossible. Still, when the opportunity to pick up the Beta version of the VCI release presented itself (and I had no idea there was a Beta release beforehand, though given the rough timeframe of release, it makes sense), I jumped at it. I paid more than I really would have liked; the final total was akin to what rarer tapes were going for back in the good ol’ days (ha!) of late-1990s Ebay. I’ve spent less on (some) used blank Beta tape lots, but I had the money, so whatever. Needless to say, I was successful, as the picture above can attest. I love the cover art. I mean, just look at it up there! It’s 1980s in all the best ways. I dig the hand drawn artwork of the era, and the cover of this particular video fits in perfectly: It’s simple, but perfect for this type of film. Though I’ll admit the absence of “The” in the title irritates me. It’s The Creeping Terror, not Creeping Terror! I got the same way with Goodtimes’ 35th anniversary release of The Blob back in the day; the cover listed it simply as Blob, which is even more awkward than Creeping Terror. It appears my copy has some staining to the box, mostly visible on the back. I pray it was only someones drink and not something more sinister. It doesn’t smell like anything troubling, or anything at all really, which is always a good sign. Yeah, I smelled the thing. Could I be any weirder? Still, you can’t fault them for a few mistakes. This is the kind of film where, without intense concentration, it would be easy to let your mind wander and your eyes glaze over. Besides, who would really want or need a deeper-than-necessary knowledge of the film (besides me, I mean)? 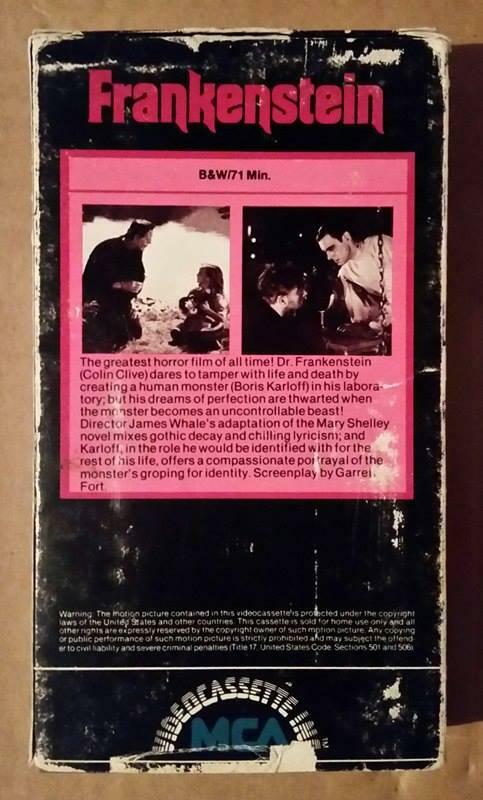 Also, the copyright date for the film is almost always listed as 1964, as demonstrated on the back of this box. It was made around that time, but another interesting thing I learned from that aforementioned thread is that it’s almost positive that this film was never actually released theatrically! It seems the public never saw the film until it was licensed for TV showings sometime in the 1970s! And that’s really just the tip of the iceberg when it comes to the wonderfully bizarre backstory of the film. There were a number of movies in VCI’s “Le Bad Cinema” line. It was probably a smart move to tag them as such, because at least as far as The Creeping Terror goes, you’re almost certainly gonna irk a lot of people if you advertise it as a ‘straight’ sci-fi/horror movie. No one is going to buy this as a ‘real’ film, and if by some chance they did, those hopes and dreams would be crushed as soon as the alien craft landing on Earth is shown as (and I’m not kidding here) blurred car headlights and stock footage of a rocket blasting off ran in reverse. Rather than pretend this is something “legit,” it was a wise choice to play up the real strengths of the flick (such as they are). There’s the tape itself, with a fairly cheap identification label affixed to it. So now you know. Really, what more can I say about it? Since I have several Betamax VCRs, there’s never an issue of playing Beta tapes (duh! ), but I generally prefer VHS (due to convenience plus it being the format I grew up with and still predominantly use for this sorta thing). As fond as I am of the format, given the choice I probably would have went with a VHS copy over Beta. There is a major benefit to having this on Beta, however: higher quality video (yes, people still argue about this, but Betamax does look superior to my eyes). Granted, there’s only so much that can be done with The Creeping Terror; even a pristine 1st generation film print is probably going to look shoddy to an extent, because it’s just a shoddy film in general (that’s why people love it!). Even with the limited number of releases out there, there are worse looking versions. In fact, VCI’s version looks pretty darn good, all things considered. Sure, there’s plenty of film scratches and dust, some scenes are too dark, and some are too light, but the image itself is relatively sharp. I mean, I can actually read the copyright notice in the opening credits; a minor miracle? I really was able to pick out little details in this version that I couldn’t in others, small victory that may be. From my very first viewing, I remember being mildly surprised that they used what appears to be the design from the opening credits of The Blob for the credits of this movie. Or maybe they technically didn’t and it just looks insanely close. That’s the title screen up above, by the way. You’ll get a better idea of this momentarily, but the superior sharpness of this particular print was evident as soon as those wondrous words that make up the name of this movie popped on-screen. You have no idea what a pain it was trying to get a decent screenshot of the titular character, and I still don’t think I was all that successful. 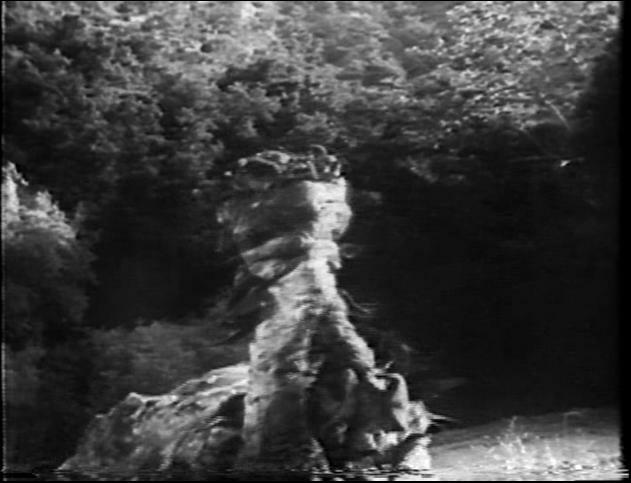 I wanted an all-encompassing shot that would give those unfamiliar with the film an idea of just how goofy the monster is, but the thing is always moving around whilst surrounded by trees and shrubbery and whatnot. Plus, the screen often being on the dark side only made things more difficult for your Northeast Ohio Video Idiot Hunter. Even the back of the video box had trouble with this (scroll back up and see if y’all don’t believe me). Rest assured, it’s a giant shaggy-carpet monster with hoses of some sort protruding from its head. It looks really bad (which of course means it’s awesome). The mostly-obscured illustration on the front cover looks better than the actual in-movie monster (dull surprise, I know). 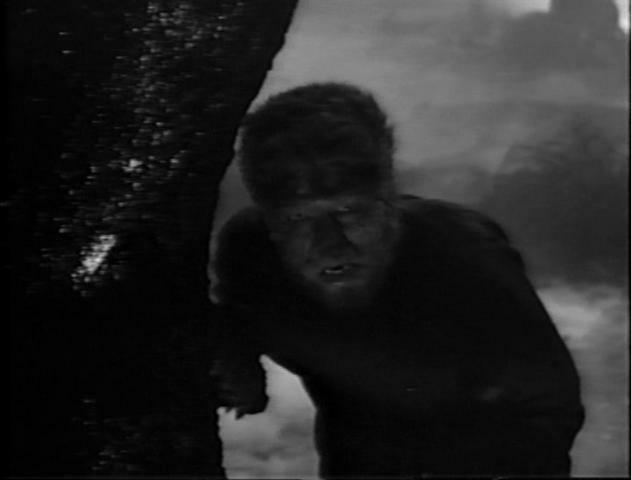 Much has been made of the “worst movie ever,” and from the screencaps of the monster alone it’s easy to see why The Creeping Terror frequently makes those lists, which I don’t disagree with. It is without a doubt one of the most inept movies ever made; I mean, even Manos: The Hands of Fate was in color and had real continuous dialogue (even if it was dubbed in later, not unlike the small bits of actual speech found in this film), and as silly as Torgo was/is, he’s infinitely more believable than the slow-moving title character of The Creeping Terror. And, hollow victory, The Creeping Terror is better than the similarly-narrated and similarly-hated The Beast Of Yucca Flats in my eyes. Kind of a wash, but whatever. Actually, for as bad as it is, I’ve seen other movies that may technically be better but I’ve enjoyed far, far less. I’ve seen early-1970s European horror films that have actually left me depressed. The Creeping Terror, though? It’s too goofy to take even remotely seriously. Though even I’ll admit that the goofiness can’t carry the entire movie. 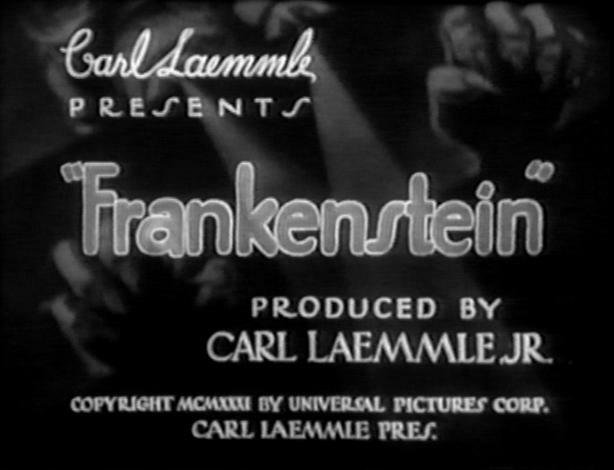 Despite what VCI says on the box, this movie only runs some 76 minutes, and there are long stretches where the monster eats person after person and/or stretches where there is no speech or narration, only silly music, which for all intents and purposes turns this into a silent movie. What I’m saying is the wackiness only goes so far before things become a little tiresome. Still, there’s obviously enough “huh? !” moments to save the whole thing (from a pure entertainment standpoint, at least). Otherwise, I wouldn’t love the flick as much as I do. Just for the fun of it, here’s some comparison screenshots between my Betamax copy and the version I recorded off of WAOH TV-29 way back in 1998. Of course, since my Betamax copy is a commercially-released version recorded in the high-quality BII mode and the one I taped back in ’98 was recorded some 16 years ago in low-quality SLP off an over-the-air broadcast on a low-power independent station and on a good-but-not-great blank tape, there’s really no direct comparison between the two versions, but hey, let me do this. It brings me joy, and don’t I deserve some of that in my life? Remember that time I provided a screencap of the title screen? Here it is again, only twice-over. As the comparison demonstrates, the WAOH broadcast is always much grayer than the Beta. Furthermore, the sharpness of the Beta version is particularly evident here. This is our “hero,” the “star” Vic Savage, aka A.J. Nelson, who is responsible for the film. Vic Savage is a pseudonym, y’see? Does our leading man inspire confidence in his Creeping Terror-stopping abilities? I’ll let you be the judge. This is from the infamous “Bobby!” scene, in which the grandfather you’re seeing above goes searching for his grandson by stumbling about and constantly shouting “Bobby!” in the most annoying manner possible. Spoiler alert: They both get eated. I’m not sure which is more infamous, the aforementioned “Bobby!” or this “Community Dance Hall” scene, in which we’re shown several minutes worth of repetitive shots of people badly dancing while the same tune plays over and over and over. Spoiler alert: They all get eated. Man, The Creeping Terror on Betamax. I can’t quite place my finger on why, but it just seems so right. I’ll venture a guess that this was the only release of the movie on the format. Quite a leap, huh? In lieu of the film as-is, less adventurous souls may opt to hunt down the Mystery Science Theater 3000 treatment on DVD, or VHS if one was so inclined. But even with Mike & The Bots, the film is pretty out there. ‘Course, if you’re feeling brave, the uncut version is also available on DVD, in a number of various multi-movie compilartions. As far as DVD goes though, your best option really is to hunt down the MST3K version, which, despite featuring the ever-annoying double-sided disc, has both their episode and the uncut movie. 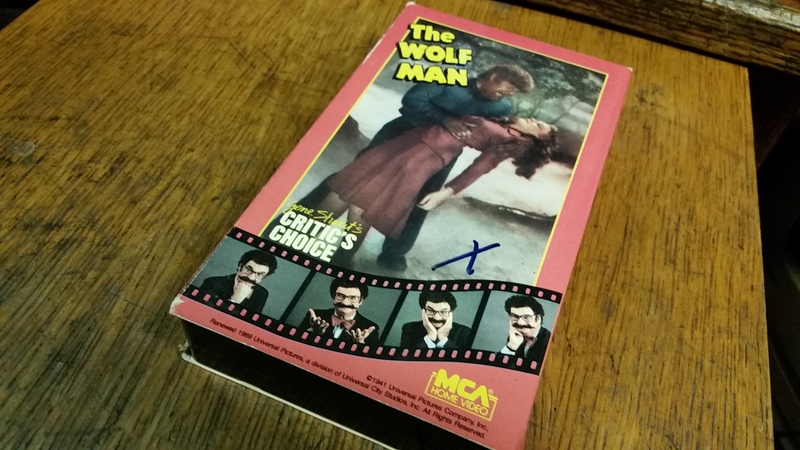 As for me, I’ve got the MST3K version (on VHS and DVD), I’ve got the uncut version in a 12-movie DVD set, I’ve got my old WAOH recording, and now I’ve got this swanky VCI Betamax copy, which has immediately become a treasured part of my collection. That’s a lotta The Creeping Terror, far more than should be allowed. This entry was posted in Uncategorized and tagged 1964, article, awful, bad, bad movie, beta, betamax, broadcast, Creeping Terror, creeping terror beta, creeping terror betamax, creeping terror dvd, creeping terror mst3k, creeping terror mystery science theater, creeping terror vci, creeping terror vhs, creeping terror video, DVD, episode, film, flick, home video, movie, mst3000, mst3k, mystery science theater, Mystery Science Theater 3000, old, overview, release, relerase, review, shlock, show, terrible, the creeping terror, vci, vci beta, vci home video, vci vhs, vci video, version, vhs, vintage, worst, worst movie ever, worst movie ever made on October 6, 2014 by neovideohunter.